1. Fifteen different companies (including CIS, the state's Centro de Investigaciones Sociológicas) have published polls results since January 2011, according to Electometro. Most of them, however, seem to do it on an irregular basis. 2. Maybe it's because Electometro gets its news from online sources (rather than print media), but it's surprising to see how lax the standards seem to be in terms of reporting basic methodological aspects of polls. Many results are presented without mention of sample size, mode, or even the estimated voting intention for parties other than the incumbent Socialists (PSOE) or Partido Popular (PP). 4. Average sample size is surprisingly high with 2,175, but that's mainly due to a single poll published in April with a staggering sample size of 45,635! I don't enough about the vagaries of Spanish politics, media, and polling to understand what may have led a media company to sponsor something like this. Without this poll, average sample size drops to 1,323. 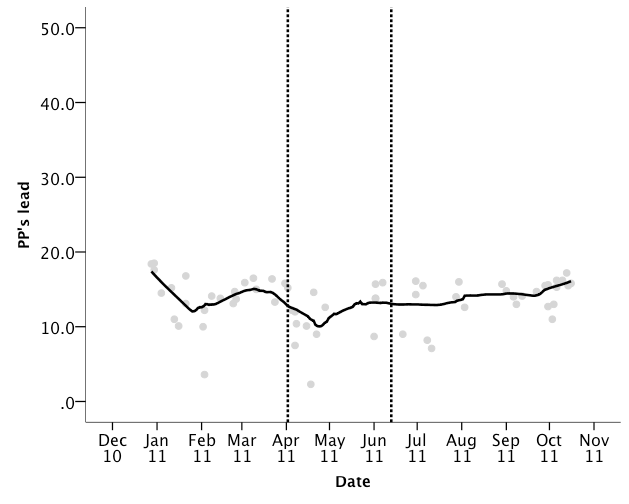 Spanish polls don't have a particularly stellar reputation in what concerns accuracy - if by accuracy we mean presenting voting intentions that end up being close to the final outcome. In 1996, polls suggested a PP lead over PSOE of about 10 points, while the actual margin of victory ended up being a single percentage point. In 2000, polls suggested a PP lead of 5 points over PSOE, but it ended up being 10 on election day. Things may be getting better, however. If we discount 2004, where the March 11 terrorist attack obviously disturbed the relation between intentions measured before the attack and the election outcome, most media polls in 2008 were close to the 44% score and 4 point lead that PSOE enjoyed over PP. 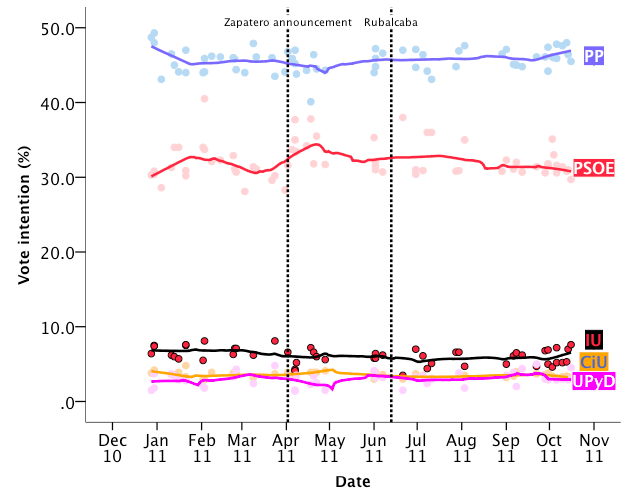 The two vertical lines represent the dates when PM Zapatero announced he would not be PSOE's candidate (April 2nd) and when Minister of Interior Alfredo Pérez Rubalcaba became the de facto Socialist candidate (June 13th). Mere visual inspection seems to suggest a positive (for PSOE) reaction to Zapatero's withdrawal from the race but no clear effects of Rubalcaba's selection. Izquierda Unida seems posed for a much better result than in 2008 (where it got 3.8%) and the same is true for Unión Progreso y Democracia. I also regressed each party's score on dummy variables for each polling company (taking CIS as the reference category) and for each month, excluding the constant from the equation and thus taking the estimates for each monthly dummy as monthly results cleaned of "house effects". In what concerns PP, the recent October results are close to the best the party has had since the beginning of 2011. 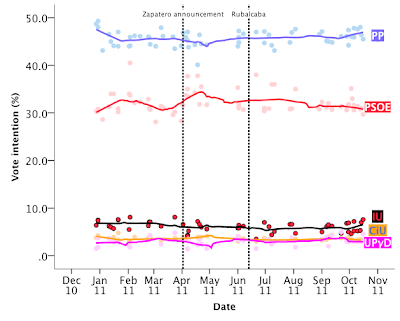 For PSOE, the highest point was in April, after Zapatero's withdrawal, which seems to have given PSOE a 4-point bump. But voting intentions for the Socialists have declined ever since and there's indeed no evidence that Rubalcaba changed anything there. The results also show interesting house effects: in comparison in CIS, pollsters like Sigma Dos, NC Report, and DYM seem to generate results that are particularly flattering for PP, while the opposite occurs with Metroscopia and Obradoiro de Sociologia. As for PSOE, the most unflattering results have come from NC Report, GAD, TNS, and Metroscopia again. Out today: a report by GAD interestingly entitled "¿Nos podemos fiar de las encuestas electorales? ", recalling past problems with Spanish polls and a tendency to underestimate incumbent vote share. Well, I started working at 2000 elections on an national poll that showed a 11 point difference for PP over PSOE when every pollster was showing only a 4-5 point difference. Few (any?) analysts admit everyone copied its result from eacho other, based on what had happened four years before, in 1996 (underestimate the party at governmente, PSOE). So, in 2000 I think (and have seen) that polls estimated correctly the gap beteween the party at government and the incumbent one, but directors at polling companies and midia preferred not to show it up. Because of this I disagree with GAD3 about that underestimating history. 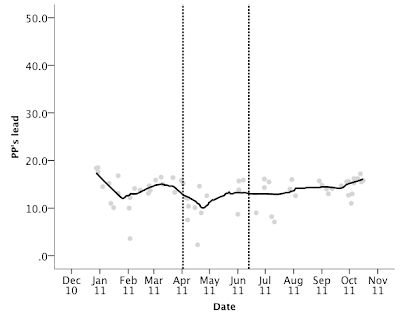 I think present polls are more accuratelly than they were in the past, and 2008 ones show this improvement. Science: What It's Up To? Marktest, 18-22 Oct, n=809, Tel. Eurosondagem, 20-25 Oct, n=1032, Tel.